8:45 - 9:00 a.m. 9:45 - 10:00 a.m.
- Get with our special last minute offer the best price for your Alhambra tickets if you buy them just a few days before the visit. 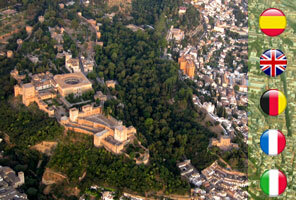 - Accompaniment by an official guide of Granada included. - Access to every area of the monument opened to the public with our guided tour. 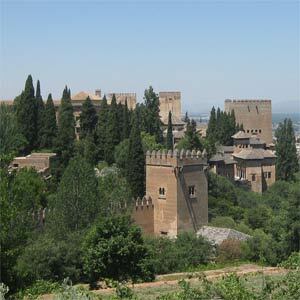 Are you just a few days in Granada and want to buy Alhambra tickets? You're lucky, because with our special Alhambra Sale: last minute offer, you can save time, money and hassles. Enjoy the monument, its palaces, courtyards, decoration and gardens, and do not miss a thing thanks to the explanations that will give you our official guide. Discover the monument in depth and go home with the feeling of having taken a walk around the Arab history of Spain. On the guided tour you will see the Nasrid Palaces, where is the impressive Courtyard of the Lions, the Alcazaba, from where you can enjoy stunning views of the city, the Palace of Charles V and the Generalife gardens, considered as “a heaven on earth”. 1. Alhambra tickets, with which you will have access to all the open parts of the monument. 2. Accompaniment by an official guide, who will explain you everything you need to know about the monument. 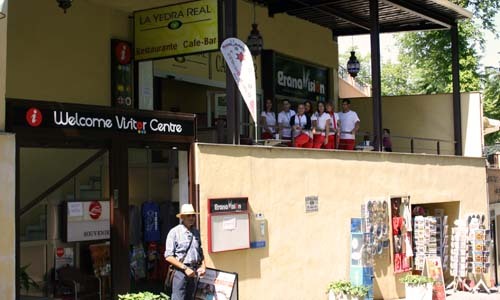 Meeting point and Time: The meeting point will always be at the Granavision Welcome Visitor Centre, next to the Alhambra (just 100 meters from the Car Park N1), between 9:40 and 9:50am. Although the tour will start from 10:00am, our Reception Centre is open from 8:30am, so we recommend you go early in the morning, so you can find out information about tourism offers in the city, enjoy our reading spot and free Wi-Fi area or have breakfast in the cafe while the children have fun in the playground. Our greatest wish is that your day in Granada starts in the best way possible. End of tour: the excursion will end at the same point of meeting. - By the length of the walk we recommend to wear comfortable shoes, and summer items to protect you from the sun, like sunscreen or a hat. - The order of the itinerary may be occasionally modified by indications of the Patronato. - You must keep your ticket to the monument during the guided tour. - Occasionally, for operational reasons, the tour can be made simultaneously in two languages. - If you want to modify or cancel your reservation, please contact us via the customer service form. After the booking process, your booking will be automatically confirmed. You can pay with your credit card (VISA and MasterCard) or bank transfer. You will receive an email of confirmation and your booking voucher. You must print this voucher and show it to our official guide before the beginning of the excursion in order to receive your entrance to the monument.